1 cup ABQ Olive Oil Company Cinnamon Pear Balsamic Vinegar reduced. Peel pears. Cut in half; and remove seeds and core. In a large saucepan, combine water, sugar and honey. Bring to a boil and stir to dissolve sugar. Add pears and reduce heat so the liquid gently simmers. Place the lid of a smaller pan on top of pears to keep them submerged. Simmer until pears are tender, about 20 minutes. Remove with a slotted spoon. 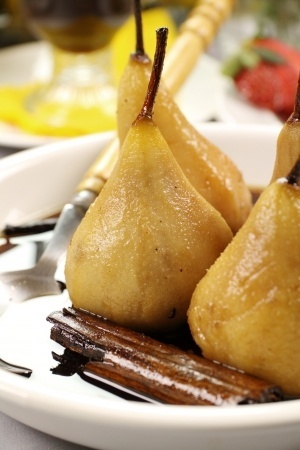 To make Cinnamon Pear reduction bring a cup of Cinnamon Pear balsamic to a quick boil, then reduce heat to a slow simmer. Simmer until the balsamic has reduced to about ¾ of a cup then pour over pears and add whipped cream, if desired.